Asus has had a busy IFA 2014, announcing the Asus ZenWatch with Android Wear and the 64-bit Asus MeMO Pad 7 with Android. 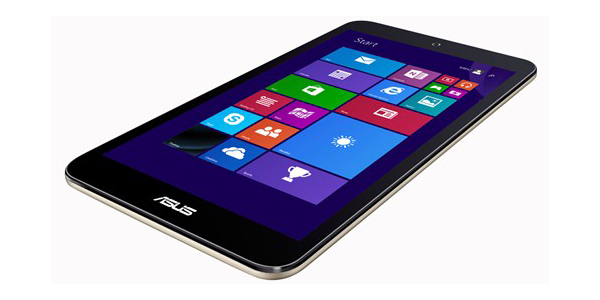 Today the company has yet another device it has chosen to unveil, the Asus VivoTab 8, an 8-inch slate that runs Windows 8.1 with a 64-bit Intel-made processor inside. The tablet features an 8 inch IPS LCD display has a resolution of 800 x 1280 pixels (188ppi), 32GB of internal storage which can be expanded through microSD by an additional 64GB, a 2MP rear camera, a 2MP front camera and a 64-bit 1.86GHz quad-core Intel Atom Z3745 processor with up to 2GB of RAM. This happens to be the same processor found on the Asus MeMO Pad 7. Asus has included a 15.2Wh (roughly 3040mAh) Li-Poly battery, which provides up to 8 hours of battery life, according to the company. While this maybe considered an inadequate battery for a tablet of its size, it does contribute toward making the ViVoTab quite light at 330 grams. The slate will be available in the classic black and white, as well as purple and gold colors. While the price was not revealed, we expect it to be priced around $249 or lower.